I get a lot of email asking me how to learn to sew, and with so many other things in life, the answer is "It Depends." Then there's the question of What Do You Sew First? Again, how do you work? Will you do better with the challenge of a complicated first project (because you really, really want the result)? Or will you be happy making a basic tote bag or placemat that you wouldn't otherwise want or use, just to learn techniques slowly? Will you not be motivated unless you're sewing beautiful fabric, or will it rip you up inside if you ruin something special? And another thing: how do you deal with frustration and failure? Because learning to sew, at least at first, will add heaping doses of both into your life, I'm sorry to say. If frustration makes you crazy-angry, with bouts of throwing things and/or screaming, try to sew when your family/roommate/pet parakeets are elsewhere. Take lots of deep breaths. One deep breath for each stitch ripped out is a pretty good ratio. If "failing" at something makes you want to sleep for a week (and either stop eating altogether or mainline Ben & Jerry's): redefine 'failure'. You didn't fail to make a skirt, you succeeded in learning how NOT to make a skirt! Go into every project, at least for the first few projects, with the goal of learning, and not with the goal of making something couture-level. Define success generously. If you got the machine threaded right, didn't sew through your finger, and the two pieces of fabric join up more or less evenly? You won. Do a victory lap. More advice: isolate your variables. Don't try everything at once! In other words, don't try to change a pattern's size or design AND do a new technique you've never tried before AND use a difficult fabric: if something goes wrong you will find it hard to figure out just what to blame (except for sunspots: I find it convenient to blame sunspots for everything). I still think the ideal first project is a full skirt; it gives you only one part of your body to fit (your waist), encourages you to jump right in to zippers (Zippers: not that hard. Take some deep breaths, go slowly, and baste; you'll be fine), and, truly, a full skirt is also forgiving of minor "mistakes". Waistband uneven? Don't tuck in your shirt! Your hem is wobbly? Walk fast, they'll never notice. Lastly, here are some things I wish I'd known when I first learned to sew … and that I wish I followed 100% now! Cutting is five times as important as construction. Honestly. Once you've cut the pattern, your track is chosen. It's much harder to recover from a cutting error than a sewing error. If you take your time on the cutting out, you will never regret it. Don't cut out patterns when you're tired, angry, or distracted (or, needless to say, drunk); you'll never wear the dress. And all those markings on the patterns? MARK THEM ALL. You won't be able to 'figure it out later' — believe me, I KNOW. Put your stuff away in the right place when you're done. That way you won't have to spend an hour cleaning up from your LAST project before you can start your NEXT project. Total buzzkill, that is. N HOBBY. Vigorously expunge the parts that aren't fun. So you screwed up. So what? Bury the evidence, deny, deny, deny, and move ON. I called this "Part One" as I may (or may not, you never know) add other parts later. But don't wait for them! Start now! Never mind, I found your blog. Looking forward to seeing your projects!I also meant to say “You’re welcome”. Great post and great comments. I wanted to chime in that I too was surprised how much of “sewing” is cutting and pressing. No cutting for me after 10:00 either (or when really hungry); ditto for setting in sleeves, or zippers. And YES, get a DECENT iron – makes it much more pleasurable. I’ve been sewing long enough now that I think I deserve good shears, too; but I would also add that learning to sew is a little like starting a workout program: it should be fun, and you don’t need to get all the fancy equipment before you start. A decent iron (I love my Rowenta), a good BASIC machine, and a seam ripper are what you really need to start. I had my girlfriend help me make a paper-tape dressform a year ago, and eventually I want a “real” one, and a serger. Now if I could just stop buying fabric, I could save up for those things!Oh, and another money-saving tip: those sewing books can be kind of spendy too (hardcover and all); check out books at your local library to see which ones you’ll want to buy and have as a reference at home, when you’re trying to sew an invisible zipper while three sheets to the wind late at night! ;^) I’ve found alibris to be a good source for used and out-of-print sewing books online. And I’d try craigslist for used machines. Also: yes on tailor’s tacks, and I love the soap-marking idea! Brilliant – and thrifty! Oh Erin!! 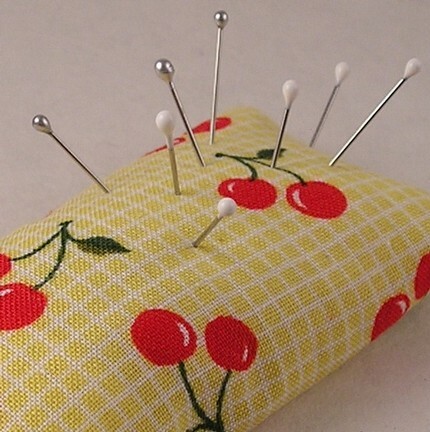 Thank you for sharing that pin cushion. I was goofing off and clicked through. I was so excited to learn that is an EMORY CUSHION. I can’t find emory cushions any where! It used to be the tomato pincushion came with a litte strawberry filled with Emory. You used it to sharpen your needles and to remove rust, but no more. I am so thrilled. I ordered the prettiest one and then came back here to point out this unique resource. Erin you always share the neatest things with us. Great advice! I esepcially like the last bit about sewing needing to be fun. I get so stressed out when I’ve spent three hours sewing and then realize I’ve done something stupid like sew the wrong sides together or cut out the wrong size. Ugh.I need to learn how to harness the power of my dress form. Any ideas? I try never to sew past the time I am tired. Also, if something is not working out, finish it up and donate it. Sometimes a style or material just wasn’t made for you.